The "Freedom Tower", or "One World Trade Center", has become New York's tallest building. It overtook the Empire State Building, after a steel column was lifted into place on the 100th floor. Work on the building began in April 2006 and when it's finished it will have 104 floors. 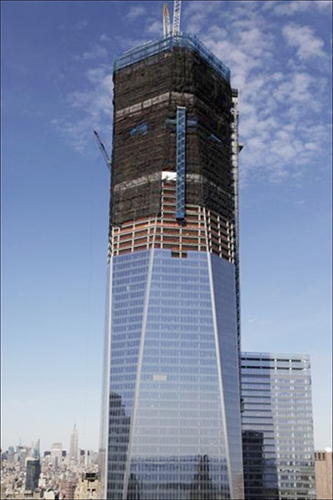 When an antenna is added as the finishing touch, it will be the tallest building in the US. The tower stands on the site where terrorist attacks destroyed the World Trade Center's twin towers on 11 September 2001.